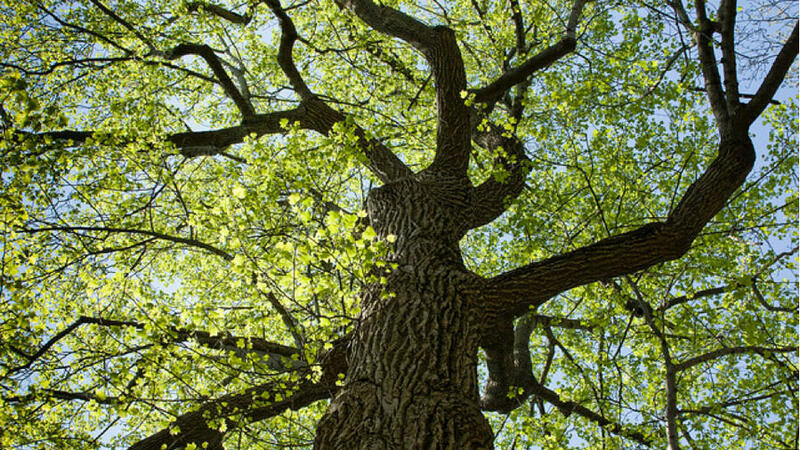 During drought, tree care is essential to the health of the habitat. We need trees, especially during a drought. Trees reduce air pollution and erosion, create habitat for wildlife and other plants, and reduce the urban heat island—even hotter, drier conditions that arise in cities as a result of too much reflective pavement. Here’s how to best care for your trees. 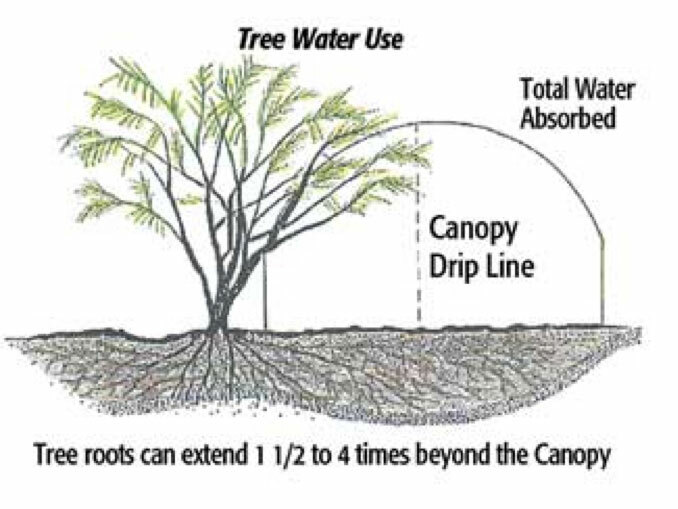 This diagram demonstrates just how insufficient watering at a tree’s base is for its needs. Water beyond the drip line. Most trees do not have tap roots (oaks and pines are among the few exceptions), therefore watering, fertilizing, and mulching at the base of a tree does not provide it the nourishment it needs. Roots grow 1.5 to 4 times beyond the canopy. In heavy clay soil, roots are pushed even farther horizontally and might be found 5 or more times wider than the dripline. A soil probe can show you how effective your watering is. Make sure moisture reaches 12 to 18 inches deep. Approximately 90% of tree roots are in the top 12 inches of soil. 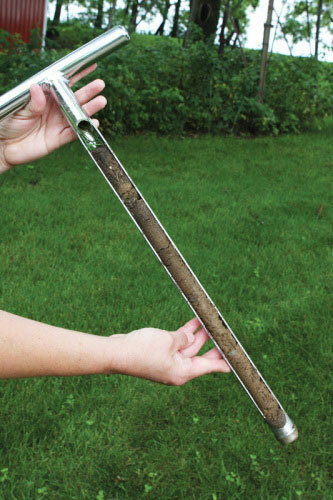 Use a soil probe each time you water to ensure that the moisture has reached 12–18 inches. Remember the trees if you take out the lawn. Many established trees are planted in or near lawns. Removing a patch of grass, upon which trees might have been dependent for many years, can cause deep stress for the trees. So be sure to have a plan for continued water and fertilizing of those trees. Look for signs of drought stress in leaves. Look for signs of drought stress. 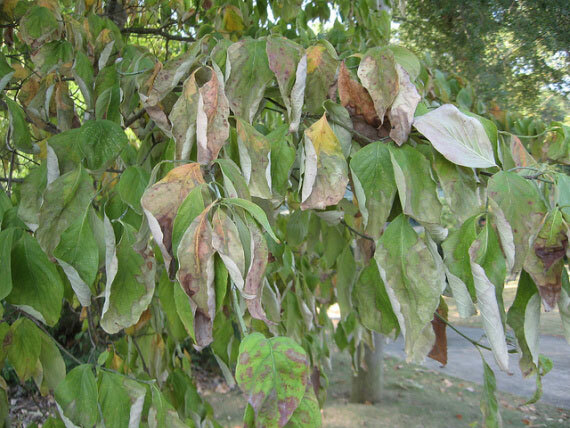 Leaves on trees suffering from drought stress might wilt, curl, or turn yellow. On deciduous trees, look for scorching, brown edges or browning between veins. On evergreens, needles might turn yellow, red, purple, or brown. Drought stress might not cause the instantaneous death of a tree, but it weakens the overall health, paving the way for secondary insects or disease infestations in following years. And if you find them, skip the fertilizer. Tree roots are especially susceptible to root burn from the salts in fertilizers when there is not enough water. Mulch to retain moisture. Layer 4 inches of organic mulch to retain moisture between watering. Bark mulch or evergreen needles are great choices. Avoid stones as they can increase the temperature, resulting in additional loss of moisture. Always remember pull mulch back 6 inches from the trunk of a tree to prevent rot. Maintain proper pruning. Remove any broken, dead, or disease-infested branches as they can cause additional weakening to a tree’s overall health. A tree with properly pruned branches will have improved structure and stability, aiding the tree in withstanding drier times.